Fifteen-year-old George Gillies lives in the Washington Territory in the late 1800s, where white settlers have an uneasy relationship with the indigenous people living there. When a local man is found murdered, suspicion falls on Louie Sam, a young member of the Stó:lō tribe. George and his best friend, Pete, follow a lynch mob north into Canada, where the terrified boy is seized and hung. Racked with doubts, George begins to ask questions. Was Louie Sam really a murderer? As George uncovers the truth, tensions in the town rise, and he must face his own part in the tragedy. Somehow, missed the part of the description at NetGalley that stated that The Lynching of Louie Sam was inspired by a true story. I bring this up not because it read like an historical account of actual events (translated dull) but because it read like a well researched fictional novel. Stewart did an excellent job of integrating the attitudes of the settlers and their concerns as well as touching on the attitude of the Natives in the overall story without making it seem out of place. The first thing that caught my attention about The Lynching of Louie Sam was the premise. I have never come across the any kind of story (fiction or non-fiction) that dealt with the lynching of an Indigenous person and the murdering having taken place in Canada. Now, while the novel dealt with these issue, it was about George coming of age and having to answer questions about himself and the people that he thought he knew. It was interesting to watch George deal with the event and to realize that Louie Sam's murder might have been caused by a false allegation. I enjoyed George Giles as a character. He was well rounded and "real". I could see a little boy feeling the way that he did about things and wanting to know the truth about what happened. But at times, I had to remind myself the George was 15 years old. Sometimes his character came off as being younger. From some reason when I first started reading the book I thought that he was about 11 or 12 years old. This was a problem that persisted throughout the book. It was at time hard to believe that a kid of George's age could be so naive and unobservant. I had a hard time trying to reconcile the fact that George did not understand certain unstated social "rules" while other children his age and younger did. George's best friend Peter on the other hand felt like a 15 year old. I felt really bad for Peter, he was dealt a rough hand and was dealing with it the only way that he knew how. He was kind of a prefect contrast to George. Peter was the more "worldly" of the two. The writing was about average. I found the Lynching of Louie Sam to be an interesting read and Stewart's writing was able to keep me in the story. I can say that in the month between reading the book and writing the review, I can't remember much about her writing style. That could be either a good thing or a bad thing. 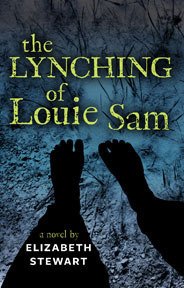 Overall, The Lynching of Louie Sam was a satisfactory read. I think what drag the grade down for me was George's character and the confusion about his age. I had to remind myself too many times that George was 15 years old and not 12 years old. It doesn't seem like a big thing but subject matter that is dealt with in the book it is important. While the writing was solid, it wasn't quite as strong as I would have like it to been. The research and historical facts is what saved The Lynching of Louie Sam from being a C+/B- book. I would recommend The Lynching of Louie Sam to anyone that enjoy Historical Fiction and would like to read about the early settlers in the Washington region. I found the historical setting by itself fascinating and well worth the read.